Join #1 New York Times bestselling author Debbie Macomber in Cedar Cove, where you' ll discover small-town life at its most appealing! 92 Pacific Boulevard. This is Sheriff Troy Davis's home. Troy, a widower, has recently suffered a disappointment in love. He was hoping to marry his onetime girlfriend, Faith Beckwith, who's returned to their hometown of Cedar Cove. But Faith ended the relationship. It seems there were a few misunderstandings between them—some inadvertently caused by his daughter, Megan? 1022 Evergreen Place is the house Mary Jo Wyse has been renting—right next door to her landlord, Mack AcAfee. And…they're falling in love! They also have a shared interest in some letters Mary Jo found in her attic, letters dating back to the World War II. Both she and Mack are trying to find out what happened to the soldier who wrote them and the woman he loved. 1105 Yakima Street. This is Bruce Peyton's house. His wife, Rachel, has just left him. Rachel's pregnant, and she says she can't handle the stress in their household anymore—stress caused by the fact that his thirteen-year-old daughter, Jolene, is jealous of her. And now a frantic Bruce has no idea where Rachel is! 1225 Christmas Tree Lane is where Beth Morehouse lives and runs her prospering Christmas tree farm. Her life is going well, and her new relationship with local vet Ted Reynolds is showing romantic promise. But…someone recently left a basket filled with puppies on her doorstep, and her daughters have invited their dad, Beth's long-divorced husband, to Cedar Cove for Christmas. So the holiday's turning out to be lot more complicated than she thought! 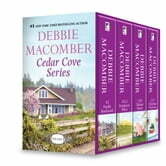 These are the final four stories set in Cedar Cove, Washington. But we're sure you'll want to visit the town again and again!